I love meat. It tastes good, has easy to digest proteins, B vitamins and iron. But it can be a killer to my grocery budget – even when I use all my tips to save on meat. 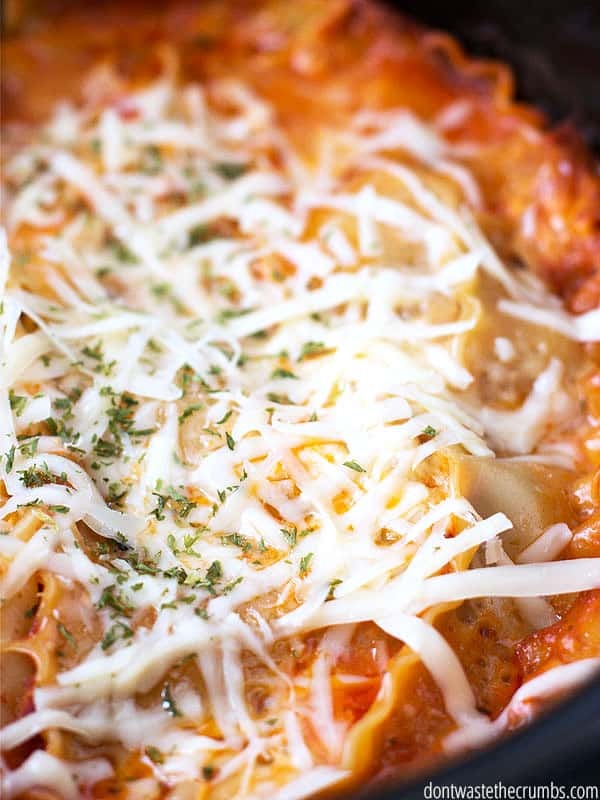 To offset this, I serve a meatless main dish to help stretch our budget, like this slow cooker meatless lasagna. That doesn’t mean we don’t get protein though! One of the biggest responses to eating less meat is a concern of eating less protein, but selecting lower cost protein means slashing your grocery bill without sacrificing nutrition. Eggs, beans, Edamame and Greek yogurt are all high in protein, but low in cost. 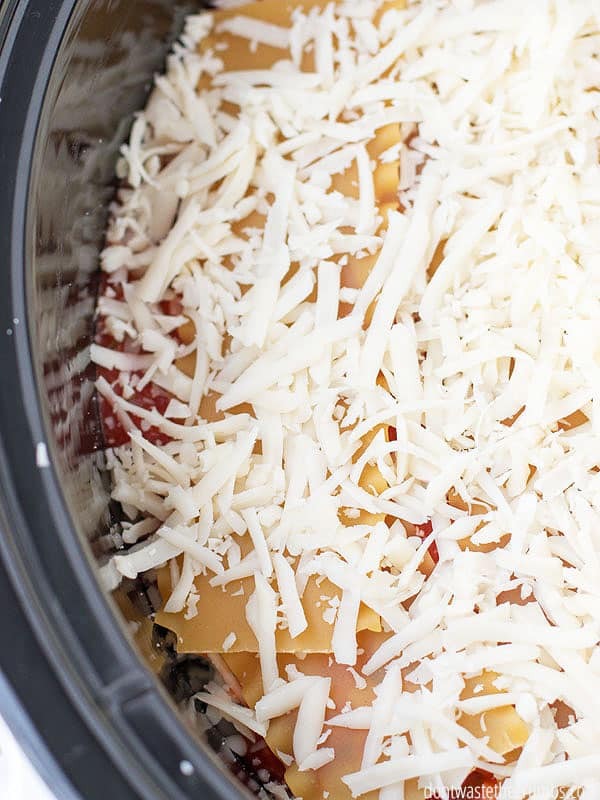 Cottage cheese is another item that’s frugal yet high in protein, and that’s why we love this slow cooker meatless lasagna so much. I have not nailed my own cottage cheese recipe, but this one is pretty good. This recipe is a slight variation of my meat version, where I add ground turkey to the sauce, but my family likes this one just the same and they don’t even miss the meat! 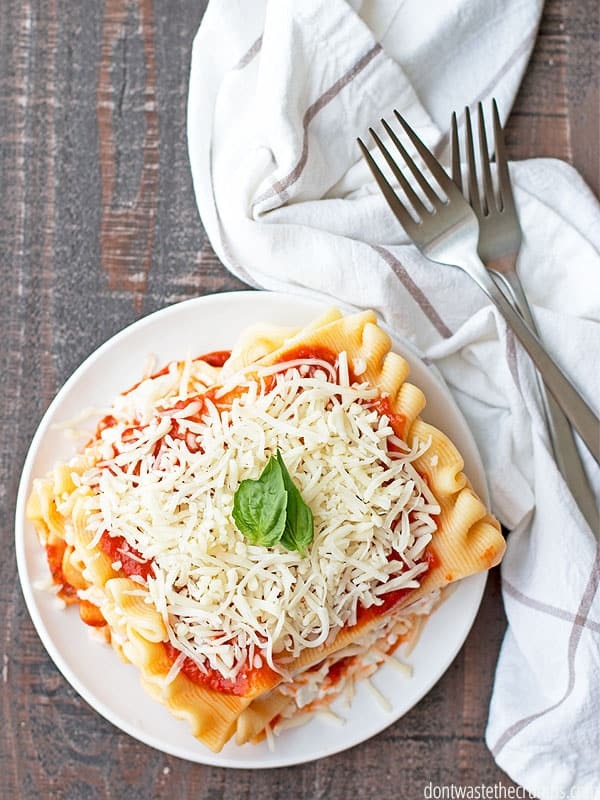 In fact, one serving of this slow cooker meatless lasagna (1/8 of the recipe) boasts 31g protein! We’re relying on cheese for the protein in this dish, but to keep the cost of cheese down, I buy cheese in 5 lb bags at Costco for $2-$2.50 a pound because it’s easier with my family of 8. On the other hand, block cheese is usually less expensive than shredded and it’s not dusted with anti-caking fiber. Whether you choose pre-shredded or block cheese is up to you, but you can still save buy buying in bulk, dividing it into smaller portions when you get home and freezing it. 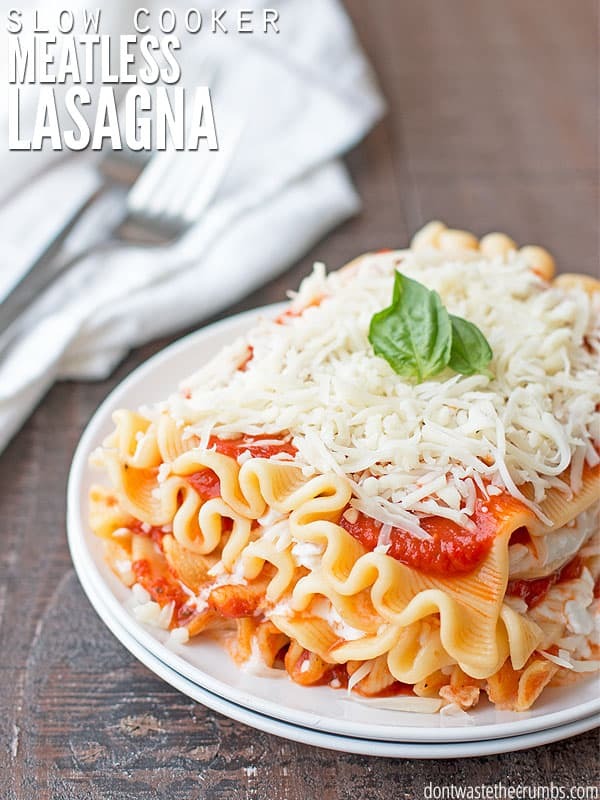 This slow cooker meatless lasagna is my personal favorite because it’s incredibly easy to throw together and since it cooks in the slow cooker, it’s virtually hands-off. Plus it works with two different cooking times, so if I happen to forget to prepare it in the morning, I can take care of it at lunch and dinner will still be ready on time. Starting with a cast iron skillet makes it easy to take a frittata from the stove top to the oven. This recipe uses 2-4 cups of vegetables such as broccoli, cauliflower, onions, mushrooms, or bell peppers. We usually eat this towards the end of the week and let it be a dumping ground of sorts from the leftover vegetables from meals earlier in the week. My go-to frittata recipe makes 8 servings with 12 g protein each. This simple recipe tastes like a burrito on a bun and is easily adaptable to whatever vegetables you have on hand. The original recipe just has green onion and carrots, but bell pepper, olives, corn, and tomatoes are nice too. My black bean burger recipe makes 14 burgers, each with 10g protein. Dry beans are cheaper than canned, so I typically keep a good stock of beans. I’ll make a big batch of beans and store portions in the freezer so they are ready to go whenever I need them. The slow cooker, Instant Pot, and even the traditional stovetop method are all easy ways to make beans. Calico bean soup is essentially a mix of different beans. You can get a bag premixed in most grocery stores, and both the 5 bean or 9 bean mixes work great. However, creating your own mix is likely the more frugal option, especially since you can choose beans that your family likes. This dish is delicious on its own, but it’s great with leftover ham or sausage too. We like to add homemade cornbread, and with calico bean soup, each serving is about 14g protein. Flautas are little rolls made with homemade flour tortillas and filled with just about anything you want. Traditionally they are deep fried, but we like them just as well baked (plus it saves a money in oil). Sweet potato black bean flautas are my family’s favorite, but we sometimes will substitute 2 cups homemade refried beans for the sweet potatoes when they’re not in season. We also like to dip them in a sauce made with 2 teaspoons of taco seasoning mix with ½ cup each of plain Greek Yogurt and homemade salsa. Each flauta contains 12g protein. And because I’m sure you’re curious, I use this slow cooker. It has lasted me for years! Adding a few meatless meals to your meal plan helps cut down on grocery costs. 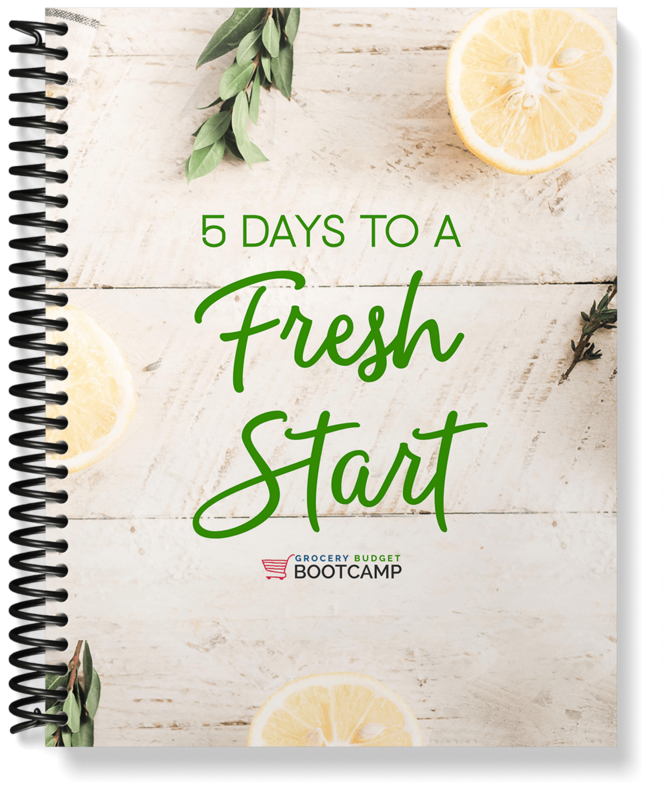 Learn more in the FREE mini-course, 5 Days to a Fresh Start! Mix marinara sauce and water. Place a small amount of sauce in the bottom of a greased oval slow cooker. Place 3 noodles on top, breaking the outer ones in half to fit. Sprinkle with 1 cup of cottage cheese; ⅔ cup of mozzarella and ⅓ cup of parmesan. Top with 1 ¼ cups of sauce. Repeat layers 2 more times. Top with the last cup of mozzarella cheese. Cook on high for 3-4 hours or on low for 6-8 hours. Let stand for 15 minutes with the lid off before serving. Do you incorporate meatless meals to save money? What’s your favorite meatless meal? Another to add to my menu rotation! Love your blog. I have made so many of your recipes and loved every single one! You are the best! Oh wow – thank you for the high regards Amelie! We hadn’t used our slow cooker in months, and I finally decided to drag it out for this recipe. It’s supposedly a good slow cooker, but pretty much every time I use it, the food turns out really mushy and not that great. Hence the reason we go months between uses. Tonight was no exception . . . I had high hopes, but it turned out all mushy and weird (kind of rubbery, and with a distinct taste, not burnt but just not a normal flavor for the ingredients that went into it) even though I followed the recipe. It looked nothing like your photos, that’s for sure! I did it for about 6 or 7 hours on low. So our slow cooker went back into the cabinet for who knows how long again. It’s just not worth it to make a meal in it when it turns out like mush every time and nobody likes it. Do you have any tips for more successful slow cooking? Is it better to cook it on high for a shorter amount of time? I’m sure the recipe is great if I could get it to turn out like it’s supposed to! Oh man, it sounds like you’ve got a slow cooker with a mind of its own! Honestly, I would do one of two things: get a new slow cooker (and test it and take it back if it doesn’t work), OR test out a really basic recipe with your slow cooker to determine its quirks. Something like beans or a whole chicken, where you can easily see when it’s done and can test slow vs. hot or see if there are hot spots. I’m sorry this didn’t work out for you Crystal! So glad to find this recipe. It was great to come home last night to a delicious steaming hot Lasagna ready to eat. I cooked it on low for 8 hours and it was perfect. The only thing I did differently was add sliced mushrooms on top of the marinara layers. Yum! My family said I could definitely make it again. Thank you!